Bay Area Real Estate market has been staying strong with prices reaching new highs. Demand from buyers has stayed unabated. In most neighborhoods in Sunnyvale, Santa Clara, and Cupertino, there is continued competitive bidding and homes are selling above the list price in most cases. Sunnyvale, in particular is HOT! 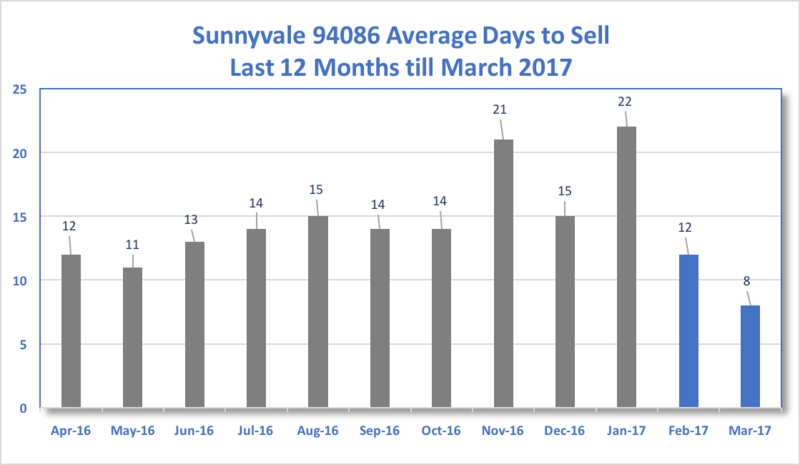 With the Sunnyvale Town Center development moving forward and the Apple Spaceship Building opening soon, Sunnyvale is seeing record high prices with year over year gains. Homes that sold in 2009 for $715K are now selling for $1.56 million. 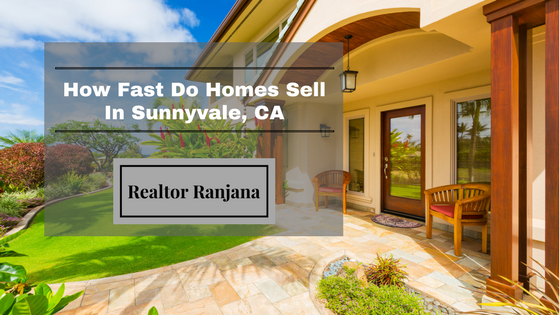 With expected policy shifts coming in from the new administration, and the recent interest rate hikes, buyers are scrambling to buy homes in South Bay neighborhoods and cities like Sunnyvale, Saratoga, Cupertino, Santa Clara, etc. 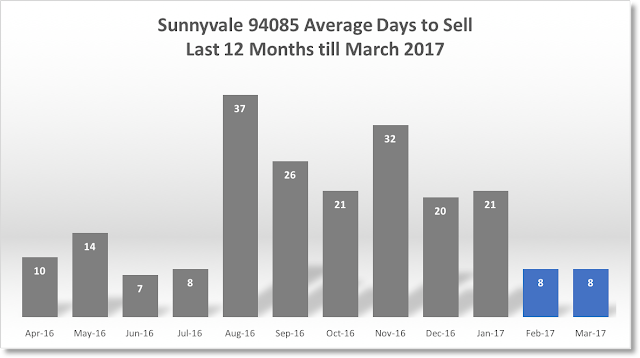 In this blog entry we look at the trend of the average number of days it takes to sell homes for the last 12 months for various zip code areas in the Sunnyvale Real Estate Market. During September 2016 the market had cooled off a bit with many houses sitting in the market for longer periods of time, with an average of 31 days. This trend continued into November, December and began improving from January after the interest rate hikes. This shows that buyer interest increased both due to seasonality, and as the chances of further interest rate hikes loomed large, buyers scrambled to lock their interest rates and get into a home at the earliest. In the 94086 zip code area of Sunnyvale, homes were in brisk demand in February and March 2017, with a similar pattern of buyers scrambling to buy homes after the interest rate hikes plus the seasonal demand resuming. Earlier, in the November 2016 to January 2017 period, homes were taking a bit longer although the number of days to sell were in reasonable number of average days of between 15 and 22. 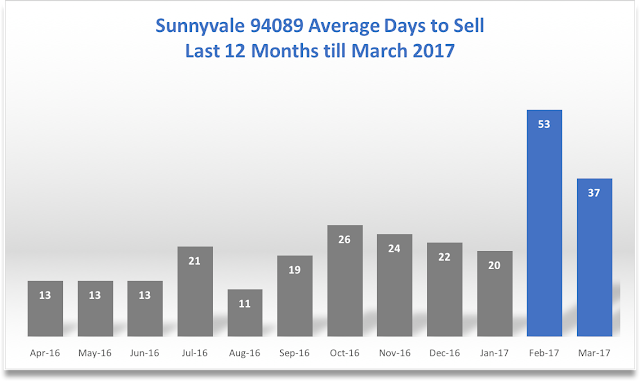 The 94085 Zip code area is seeing aggressive buying with homes selling on average within 8 days of listing. The same neighborhoods were seeing averages ranging from 37 days in August 2016 to 21 days in January 2017. This trend is expected to continue in these relatively lower priced localities as out priced buyers from other zip codes find homes closer to the 101 and 237 highways and the Moffet Park office zones. In the 94089 Zip Code Neighborhoods of Sunnyvale, there are significantly fewer residential single family homes compared to other zip code neighborhoods. There are significant numbers of townhouses in this zip code area. Single family homes in this zip code area are selling on average within 8-11 days. However, the above chart is skewed due to two homes in February 2017 and one home in March 2017 staying on the market for several months. The median days to sell number for the above zip code area is very high for February at 48 days while for March, the Median Days to Sell is realistically 9 days. Send me a message and I will be sure to get back to you at the earliest. 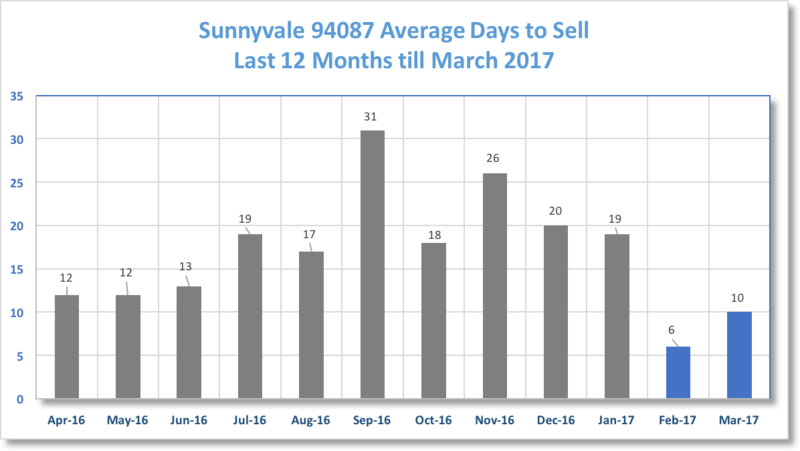 Visit www.SunnyvaleCupertinoRealty.com to learn about selling your home and to search for new listings. Save your home searches and be notified of new listings, price changes, and easily communicate your interest in seeing properties, to Realtor Ranjana.